It’s safe to say ‘summer’ in the NSW Snowy Mountains hadn’t really jumped out at me before. I have climbed Mt. Kosciusko in the past and enjoyed the pretty town of Thredbo but that was a long time ago now and I was oblivious to all the activities this area has to offer. So when Destination NSW invited me on an ‘active’ summer weekend in the snowies I was so excited and couldn’t believe all of the fun they had organised for us! I wanted to share my awesome experience with all of you and give you the low-down for an action packed fun-filled weekend! We arrived at Sydney airport on Friday morning and with an all-girls group, I knew we would be having a few giggles over the next few days. Our flight was with Regional Express to Cooma and takes approximately 1 hour from Sydney, you can also drive which takes around 6 hours from Sydney. After hiring our car from the airport we drove for 30 minutes to the absolutely stunning Lake Crackenback Resort and Spa located on the border of Mt. Kosciusko National Park. This is a beautiful place nestled in the Thredbo valley and surrounded by the stunning snowy mountains. I saw an abundance of Australian wildlife here including kangaroos, echidnas, birdlife and deer. Upon arriving at the Resort I felt an immediate sense of calm. This is quite the usual response for me, I think having grown up in the Welsh and English countryside might have something to do with it. The fresh clean air, the beautiful lake and the desire to spend the next few days outside with nature, was something that took me back to my childhood and made me feel very comfortable and at ease. We were greeted with such a warm welcome from the friendly staff at Lake Crackenback. Upon checking in we were helpfully given so much information about the local area and resort facilities and then shown to our rooms. Lake Crackenback has many different room options to choose from ranging from 1 – 3 bedroom apartments and chalets. I had a one bedroom apartment which had a fully functioning kitchen, the comfiest bed ever and a clean, modern bathroom. Also I had an outdoor area where the kangaroos would often make a visit. The Resort is only a 15 minute drive from Thredbo village where many activities and beautiful surroundings can be enjoyed but, if you don’t want to venture out of the resort they have many complimentary and organised activities to sign up for. Lake Crackenback is a perfect base to explore the region from sightseeing, local attractions, snowsports in winter and the many summer activities including Segway eco tours, walking, mountain biking, canoeing, archery or fishing. On our first day we organised a guided Fly Fishing tour at Lake Crackenback with Matt from the Fly Program. I have never done any type of fishing and it’s probably not something I would usually sign up for (for this reason) so to be given this opportunity was somewhat daunting but exciting all at the same time. To my great surprise, I LOVED this activity and spending time in the river was so therapeutic. Fly fishing is not the easiest thing to nail but after a while I felt like I was getting the hang of it! Even though i didn’t catch anything it’s nice to know that all the fish are placed back into the river. The activity started with learning the basics of fly fishing on the lawn, then we had a beautiful picnic by the lake and went down to the area we would start our fishing. We changed into our waders and boots and started at the bottom of the river. This gave us an opportunity to work our way back up the river in the hope of catching some rainbow trout. Two of the other girls in our group managed to catch something so next time it’s a must! It was awesome to get to know Matt on the experience and we had some great conversations about his new organisation The Fly Program which I found so inspiring. The Fly Program is a not-for-profit organisation seeking to raise the awareness and combat the impacts of depression, post-traumatic stress disorder and suicide in the Australian adult male community. In the belief that exposure and participation in the natural world increases energy and a heightened sense of well-being, increasing feelings of happiness and health (which is something I believe in one hundred per cent). If you are in the Snowies and would like to go Fly Fishing you can book directly with Matt through the Fly program or through the resort, here. Later on that evening we had a beautiful Dinner at one of the hotels restaurants ‘Cuisine’. Cuisine restaurant is on the river (it feels like you are on a boat!) 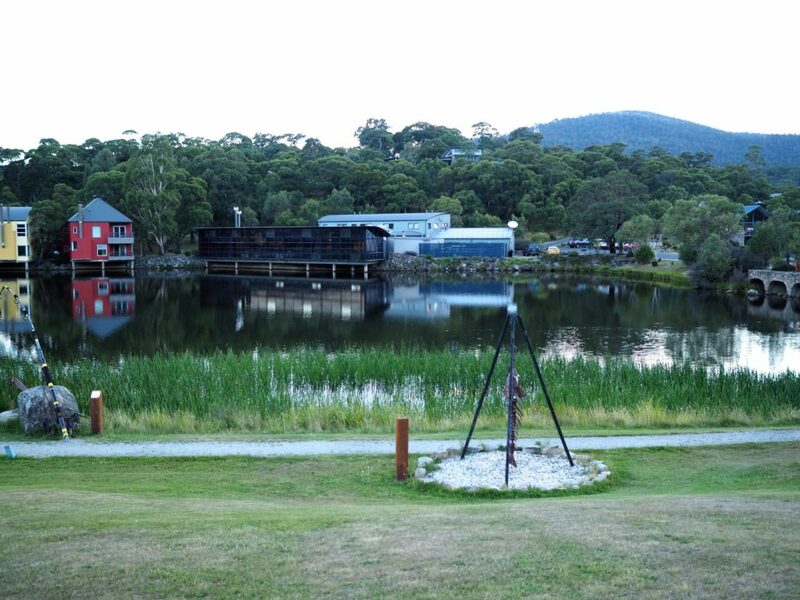 and has the most spectacular views of the Lake Crackenback waterfront and mountains beyond. Cuisine Restaurant offers authentic, flavoursome dishes incorporating produce from the local region. Also this is where breakfast takes place at the resort and in the morning the Lake takes on a completely different outlook. One morning we had the most incredible mist (the morning I forget my camera – of course!) which was so beautiful to see. The dinner at Cuisine was so delicious, visually stunning and I have to mention that the service at the restaurant and in the resort was so friendly and accommodating – thanks Lake Crackenback. The following day we took part in a Mt. Kosciusko Guided Summit Walk with Rosalie from Thredbo Alpine Village. It was so nice to have such a knowledgeable guide, Rosalie told us all about the mountain and gave us in-depth information about the alpine area – from flowers, wildlife, giant rock formations and waterways. Mt. Kosciusko has the highest peak in Australia and it’s cool when you get to the top you can stand on the peak and literally feel on top of the world (well….Australia at least). The hike is so beautiful, you can take in the views that sweep from the Victorian Alps right across the Kosciuszko Main Range all while standing on the highest point in the land. Just be prepared for a severe weather change so take some spare clothes such as a waterproof and a fleece. When we went the weather changed dramatically compared to the weather at the bottom of the mountain, it got much colder and windier closer to the peak. Such a beautiful dinner arranged through the resort Lake Crackenback. This is a must for anyone visiting the area and dinners are held from October through to April. For someone who stills feel like a tourist (after seven years – haha!) I absolutely loved it. Nev and his crew were so professional but friendly at the same time and I learned a thing or two about the Australian bush and the traditions associated with it. I wouldn’t mind a whip-cracking lesson next time – so cool! 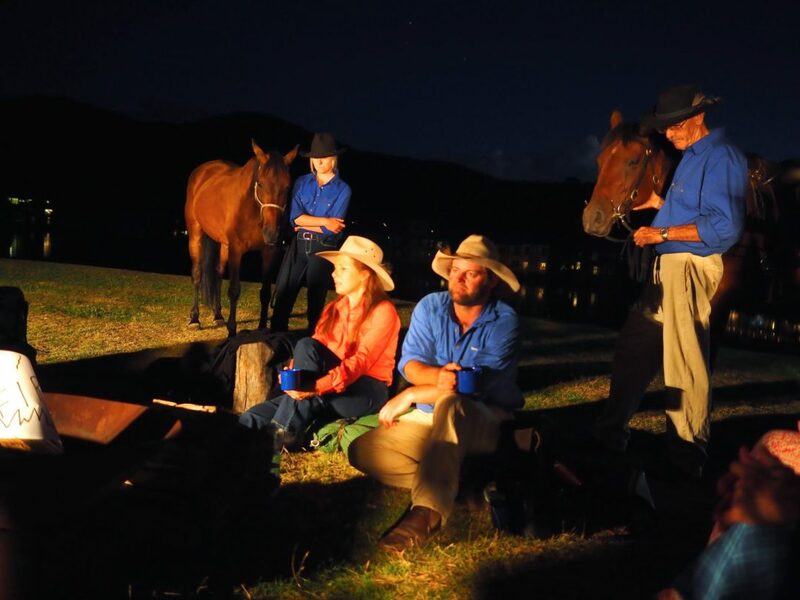 ‘The Man from Snowy River’ includes an outdoor dining experience in the shadow of the Snowy Mountains. We enjoyed a hearty three course feast, inspired by the bush and featuring the best Australian produce – think damper, pot roasts and pavlova. After dessert we went and sat by the campfire with our cup of ‘billy tea’ and listened to yarns from the ͚real͚͛Man from Snowy River͛ all within the beautiful surrounds of Lake Crackenback and the Thredbo Valley. Nev also runs and owns Thredbo valley horse riding in the local area where you can take part in pony rides, trail rides and private lessons. We did the beginner clinic which utilises the village skills parks and valley floor trails with the aim of concentrating on the fundamentals of mountain biking. Brad taught us the neutral riding position, basic breaking techniques, bike control and cornering. This was a great introduction to mountain biking and it made me feel confident on the bike. I have to be honest I did a LOT of mountain bike riding as a child (which is a long time ago now) but I found it all came back to me and I’d love to go back and do some chairlift gravity trails. After our active morning on the bikes we decided to stop off for lunch and a Schnapps tasting at Wild Brumby Distillery. Such a beautiful restaurant and setting! Here you can enjoy award winning schnapps, Austrian inspired food, contemporary art and again we experienced such friendly and accommodating service here – thanks Wild Brumby! The Distillery is situated right in the heart of the Australian high country between Jindabyne and Thredbo. You have to pay this gorgeous place a visit if you are in the area – it’s perfect after a morning of strenuous activity! After lunch I was lucky enough to be booked in for a full body massage! This was such a treat – I never go for a massage so I was so grateful to get one during our stay. The Spa uses Thalgo & Alpha-H products. These products are meticulously formulated exclusively for Day Spas and Salons using only the purest of ingredients. Created to not only offer beautifully luminous skin but a complete solution to Spa Wellness. There are many treatments on offer here, ranging from massage and beauty treatments or pampering spa packages. After my massage we went for a casual dinner at another of the resorts restaurants the Alpine Larder. Think traditional wood fired pizzas, delicious pasta, mouthwatering tapas, hand tossed gourmet salads and naughty but very ice desserts. Alpine Larder is open all day so you can stop by for your morning coffee before enjoying a day of activities, a casual lunch, afternoon tapas or a casual dinner including wood fired pizzas. The following morning we all headed back to Sydney feeling pampered, physically challenged and full of goodness from all the local produce we consumed!